A head by Piot is always pleasant to come upon in our galleries, and they have several times made their way to out shores (England). There is nothing meretricious about them; the model is always well chosen for something beside mere regularity of features. We become interested in the personality of the artist's sitters. For the first time, large numbers of pictures were painted whose sole raison d’être was the depiction of such beauty; not so much in the form of specific portraiture, but more as an homage to feminine beauty in its own right…Painters of beauties spread their net far and wide, to lay before an eager public examples from many different nationalities and social classes…A new sort of feminine beauty was perceived to have been invented by Parisian painters from about 1860 onwards. Piot did not restrict his imagery to the female form. He also completed many works with children, a significant development as childhood imagery became very popular at a time when people involved with the education of children began to question just what it meant to be a child. Piot’s work, in all of their delicate radiance nevertheless addressed many of the interests and desires prevalent during the nineteenth century. We find in the Salon catalogues a list of these fanciful titles, together with a number of portraits into which, as is easy to conjecture from the head we copy, the artist would put a mingled grace and sincerity of expression not always found in these works. Throughout his entire Salon period he remained a pupil of Léon Cogniet. In 1883 he became a membe r of the Société des Artistes Français, and later became a Membre Perpétuel (life-time member). Piot also received an honorable mention in 1890 for his work submitted to the 1889 Exposition Universelle. It is not known when Piot died, though his last Salon entry is most likely 1909. Either Piot died at a very old age, or he began his Salon career at a very young age. The length of his Salon entries is exhausting and creates a sense of mystery. Some intriguing questions remain to be answered. Was Étienne-Adolphe the son of Adolphe Piot? Was he exhibiting similar works and working under the same master? 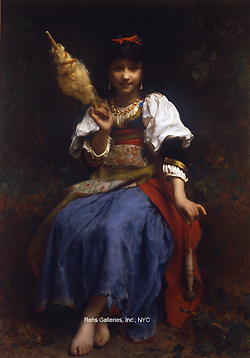 Any works pre-1876 would be attributed to Adolphe Piot, and those after 1890 can be attributed to Étienne-Adolphe Piot, if they are indeed two separate artists. The interim period is questionable as the artists, or artists, never exhibited together at one Salon, suggesting that it is, as history says, one artist, instead of two. But this sense of confusion in the names of the painter, and the possibility that he had a son who worked with him or who continued his style of creativity, awaits further clarification. Regardless of these issues, works linked to the name of Adolphe Piot subscribe to the portrayal of the fashionable creation of childlike innocence, both in his youthful sitters and females alike. In this, even when depicting the lower classes, Piot infused his pictures with a sense of elegant humanity and picturesque refinement that appealed to bourgeois Aesthetic taste which was in the ascendancy during this part of the nineteenth century.